John Jacob Astor (July 17, 1763 - March 29, 1848) became the first American millionaire. He was the creator of the first Trust in America, from which he made his fortune in the fur trade, real estate, and opium. Astor was a very ambitious and shrewd businessman amassing a fortune in only six years. In 1808, he organized the American Fur Company in response to British Fur trading dominance in Canada. When he retired and sold his fur-trading business, he spent his time and money to improve the lives of others. He left an endowment of $400,000 to New York City for a public library, later known as the Astor Library. This library eventually became what is now the world-famous New York Public Library. Astor was born in 1763 to a poor working class family in Waldorf, Germany. He was the youngest of three sons born to butcher (Johann Jacob Astor). Astor left Germany at the age of 18 to work with his oldest brother, George Astor, manufacturing musical instruments. Although, he was earning a good living in London, he left for the United States. Astor arrived in America in March, 1784, just after the end of the Revolutionary War. He traded furs with Indians and then he started a fur goods shop in New York City in the late 1780s. The fur trading business was very lucrative for Astor, he began trading internationally and quickly made a name for himself. During this time in New York, Astor met and married Sarah Todd. They had eight children. 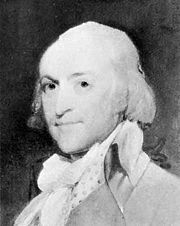 Astor took advantage of the Jay Treaty between Great Britain and the United States in 1794, which opened new markets in Canada and the Great Lakes region. By 1800, he had amassed almost a quarter of a million dollars, and had become one of the leading figures in the fur trade. In 1800, following the example of the "Empress of China," the first American trading vessel to China, Astor traded furs, teas, and sandalwood with Canton in China, and greatly benefited from it. The Embargo Act from Thomas Jefferson in 1807, however, disrupted his import/export business. With the permission of President Jefferson, Astor established the American Fur Company on April 6, 1808. He later formed subsidiaries: the Pacific Fur Company, and the Southwest Fur Company (in which Canadians had a part), in order to control fur trading in the Columbia River and Great Lakes area. The Columbia River trading post at Fort Astoria (established in April 1811) was the first United States community on the Pacific coast. He financed the overland Astor Expedition in 1810-1812 to reach the outpost. Members of the expedition were to discover South Pass through which hundreds of thousands settlers on the Oregon, California, and Mormon trails passed through the Rocky Mountains. His fur trading ventures were disrupted once again when the British captured his trading posts during the War of 1812, but rebounded in 1817 after the U.S. Congress passed a protectionist law that barred foreign traders from U.S. Territories. The American Fur Company once again came to dominate trading in the area around the Great Lakes. In 1822, Astor established the Astor House on Mackinac Island as headquarters for the reformed American Fur Company, making the island a metropolis of the fur trade. A lengthy description based on documents, diaries etc. was given by Washington Irving in his travelogue Astoria. In 1802, Astor purchased what remained of a 99 year lease from Aaron Burr for $62,500. At the time, Burr was serving as vice president under Thomas Jefferson and was desperately short on cash. The lease was to run until May 1, 1866. Astor began subdividing the land into nearly 250 lots and subleased them. His conditions were that the tenant could do whatever they wish with the lots for 21 years, after which they must renew the lease or Astor would take back the lot. "If I could live all over again, I would buy every square inch of Manhattan." In the 1830s, John Jacob Astor figured that the next big boom would be in the buildup of New York, which would soon emerge as one of the world’s greatest cities. Astor withdrew from the American Fur Company, as well as all his other ventures, and invested all his proceeds on buying and developing large tracts of land, focusing solely on Manhattan real estate. Foreseeing the rapid growth northward on Manhattan Island, Astor purchased more and more land out beyond the current city limits. Astor rarely built on his land, and instead let others pay rent to use it. After retiring from his business, Astor spent the rest of his life as a patron of culture. He supported the famous ornithologist, John James Audubon, the poet/writer Edgar Allan Poe, and the presidential campaign of Henry Clay. At the time of his death in 1848, Astor was the wealthiest person in the United States, leaving an estate estimated to be worth at least 20 million dollars. In his will, in addition to the orders to build the Astor Library for the New York public, he had a poorhouse erected in his German hometown, Waldorf. As a symbol of the earliest fortunes in New York, John Jacob Astor is mentioned in Herman Melville's great novella "Bartleby the Scrivener." The great bulk of his fortune was bequeathed to his second son, William Backhouse Astor Sr., instead of his eldest son John Jacob Astor II (1791-1869). John Jacob Astor is interred in the Trinity Churchyard Cemetery in the New York City borough of Manhattan. The famous pair of marble lions that sit by the stairs of The New York Public Library at Fifth Avenue and Forty-second Street were origially named Leo Astor and Leo Lenox, after Astor and James Lenox, who founded the library. Then they were called Lord Astor and Lady Lenox (both lions are males), before being given the names Patience and Fortitude by Mayor Fiorello LaGuardia during the Great Depression. History of "John Jacob Astor"
This page was last modified on 17 May 2018, at 15:56.